Tracing the first Audi-to-Formula 1 rumors involves a trip much further back than some might expect—to 1999 when the German brand set its sights on the 24 Hours of Le Mans. "I remember the early days of testing the very first prototypes, and we were already hearing from some of the big bosses that we were headed in the wrong direction," one insider told me. "There were board members back then who felt F1 was the only place for Audi, and all the rumors since then have a familiar sound going back to '99." But the latest rumors were, for the first time, hard to dismiss. Audi Sport attempted to quash the speculation in late October with a simple post to its Facebook page – "Audi in Formula 1? These rumors keep appearing with regularity since years. It's pure speculation again this time and without any foundation. We are committed to the FIA WEC, DTM and GT racing." While there's no reason to doubt Audi is committed to its primary sports car programs, the length of its involvement in the World Endurance Championship is definitely worth questioning, even now. So rather than connect the dots, I'll lay out all I've learned through either direct confirmation or back-channel sources, some of the unconfirmed input I've received through other associates, and add in a bit of context elsewhere so you can form your own opinion. • Audi is returning to the WEC next year with the latest round of updates to its R18 e-tron quattro LMP1-Hybrid. That car first appeared in 2011, and went through an almighty revision at great expense for 2014. • With the pace being shown by Toyota and Porsche, the R18 – at least in its current shape and form – is near the end of its development cycle. • I've been told that 2015 will indeed be the swansong for the R18, and if that's true, its replacement would be needed for 2016. It would come at an even greater expense – enough to fund one of the smaller Formula 1 teams. • Porsche's return to LMP1 led to immediate speculation that its sister brand Audi was destined for F1, and the timeline for Audi's exit from sports cars is said to be somewhat fluid, dependent on the maturation of Porsche's 919 Hybrid program. • The Audi-to-F1 topic is reviewed by its board on an annual basis. • I've been told by multiple sources for years that the plan has always been for Porsche to serve as Volkswagen Group's sole representative atop LMP1. • Audi's annual LMP1-H budget is $242 million. • While assembling its new LMP1 program, Porsche hired a few top mechanics away from Audi's P1 team with the promise of lifetime employment. • All signs point to Porsche being ready to take the baton from Audi next season, and a win at the 24 Hours of Le Mans would reportedly cement Audi's departure for 2016. • Annual profits from within the Volkswagen Group are soaring. VW is a close second to Toyota in annual vehicle sales, and Audi has long been a star financial performer for VG. • Considering the sums freely apportioned for both Porsche and Audi P1 programs—said to be a half-billion dollars annually, diverting Audi's current budget to F1 and adding another $250 million on top might not be as big of an investment as it sounds. • With a rough idea of where the R18 will find itself against Toyota and Porsche next year in the WEC, and knowing that the VG board members are said to be waiting for Porsche to demonstrate its readiness to take Audi's place on the global sports car stage, it leaves the question of the R18's successor somewhat unanswered. • F1's share of its TV income and general profit structure could more than offset Audi's expenses – a big change from sports car racing where manufacturers absorb almost all of the costs without any hope of recouping even a fraction of what's spent. • Former Ferrari F1 boss Stefano Domenicali is starting at Audi this week. Dr. Wolfgang Ullrich (ABOVE) says it is in a non-motorsport capacity. But will it remain that way? Someone of Domenicali's talents as a team manager would not necessarily be needed until a new motorsport program was fully implemented. • As mentioned above, the need for a brand-new R18 is evident, and with one season left on the current car, 2016 would be the year for its introduction. To have a new car readied, massive financial investment and a significant chunk of Audi Sport's workforce would need to be dedicated to the creation of a new car while the 2015 WEC takes place. • On the surface, Audi's faced with two show stoppers: Leaving sports car racing at the end of 2015 for F1 in 2016, and building a new sports car in 2015 for 2016. I'm told it's one or the other, instead of concurrent LMP1-H and F1 endeavors going forth. 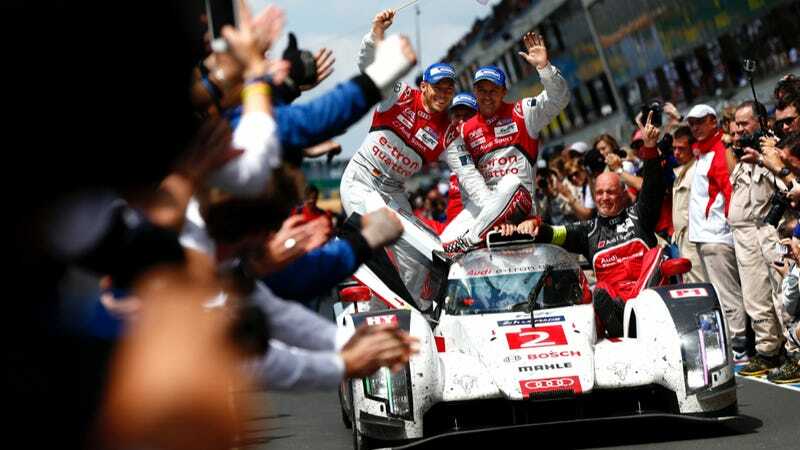 • After a decade and a half of Le Mans-based racing, Audi owns sports car racing from an image and promotion standpoint. Audi equals Le Mans, and that's been the case for years; there's nothing left to mine from endurance racing. In terms of growth and reaching new audiences—those who might want to buy an Audi—it's fair to say the German brand has been preaching to the choir for quite some time. With diminishing returns associated with a continued WEC program, a move to F1 would open a much bigger world to Audi, and thanks to the giant television ratings and global following that comes with F1, VG increases its market share with Audi once it parks its Le Mans program. • Audi Sport has spent 2014 moving from its base in Ingolstadt – a former grocery store (not kidding – I've been there) into a new technical center based in Neuburg. Audi Sport's new, dedicated building is 300 feet wide and 900 feet long (the width of an NFL football field and the length of three NFL fields...). Renowned Audi Sport engineer Howden "H" Haynes is said to be departing the R18 program at the end of the season. Haynes, along with Leena Gade and other engineers, have been contracted to Audi through H's UK-based Progressive Motorsport firm. • Gade has reportedly been hired directly by Audi, and given a contract that would keep her within the company until retirement. • A billing code for an unnamed Audi Sport engine department exists, yet unlike the WEC, DTM and GT projects, transactions, billing and accounting for that department is kept private—behind a firewall to keep prying eyes from other departments locked out from expenditure details. • Progressive Motorsport has been supporting Formula 1 teams for a few years with its 3D printing services and its pit structures. • Audi Sport engine guru Ulrich Baretzky is known for starting all new engine designs with a single-cylinder concept. In a break from tradition, a two-cylinder F1 test mule is said to have been in operation for more than a year. • Haynes is said to be working with former Veloqx Motorsport boss Sam Li on a new project. It has been rumored the two could also be part of a support network—as vendors—for an Audi F1 program. • Audi Sport employs approximately 275 people for all of its sports car racing programs. That number would need to increase significantly if an in-house F1 project were to take place. • Audi's increased interest in F1 coincided with F1's move from naturally-aspirated V8s to small, fuel-restricted/single-turbo/petrol-fed V6s. • Another source had added to the Audi-will-only-do-F1-in-partnership-with-someone theme. Red Bull Racing has been mentioned, but every source I trust has said Audi would not be interested in limiting its role to providing engines. A full F1 program, chassis included, is the consensus. • Audi's experience with KERS systems in LMP1-H and DRS in the DTM, along with advanced electronics and aerodynamics in its Le Mans prototypes, would make a transition to F1 much easier than a manufacturer coming into F1 with limited state-of-the-art knowledge. • Longstanding chassis partner Dallara has been mentioned as a resource for an Audi F1 program. • Volkswagen Group chairman Ferdinand Piech has made no secret of his wish to see the Auto Union name return to F1 to recreated its famous duels with Mercedes. It has been suggested an Audi F1 program would happen under the Auto Union banner. • Despite the suggestion that Audi's move to F1 would be predicated on Porsche (Above) winning at Le Mans next year, there are some within Audi that would like to close their P1 tenure on top—beating Porsche and leaving Le Mans—without a peaceful passing of the torch. Like every good (and unconfirmed) story in motor racing, the strands of information can be woven to suit any outcome. Some items would appear to be interconnected, while others are too random—too scattershot—to arrive at a conclusive verdict. In a court of law, everything above would be considered circumstantial evidence, yet there are enough kernels of truth to keep from painting the rumors as completely false. What does it all mean? Is Audi headed to F1? You be the judge.